"Bacon, Swiss cheese and onions mingle in perfect harmony amidst the eggs and cream in this timeless classic. 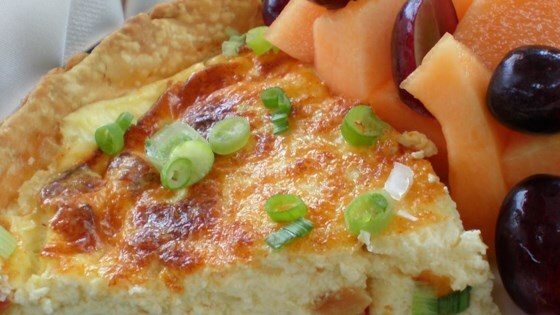 Perfect for breakfast, brunch, lunch, dinner or just an indulgent snack!" See how to make an impressive classic with eggs, bacon, and Swiss cheese. a bit runny, so will add a bit less half and half. added mushrooms and frozen spinach, used 'real' bacon bits, and sauted the onions first. Yum!